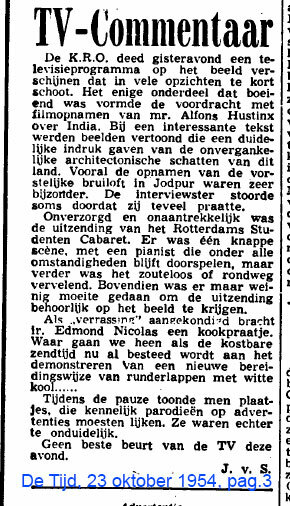 The information on this page concerns the first decennium of Dutch television. Information on the rather obscure and unique Dutch broadcasting system can be found on wikipedia. There were several member-based broadcasting organizations, each with their own religious or political ideology. Mentioned below are the AVRO (liberal), the VARA (socialist), the KRO (catholic) and the NCRV (protestant). These organizations still exist, but today most of these, including the ones mentioned on this page, are almost completely interchangeable with commercial stations. One can watch someone cooking anytime during the day on at least one television channel. Commercial interests play a large role: cooking programs abound with product placement, and one can create the illusion of cooking as a chef by buying the cooking wares promoted by celebrity chefs. And of course the viewer will want to buy their books! As for buying books, nothing has changed. The first cook on the Dutch radio, P.J. Kers, published two cookbooks while employed by the AVRO (liberal) in 1928 and 1929, before ‘changing ideology’ and transferring to the socialist VARA. He continued publishing cookbooks, this time with slightly simpler recipes for the labourers that were the target audience of the VARA. Kers also wrote cookery books for the Liebig Company (40 Liebig recepten samengesteld door den radiokok P.J. Kers, 1935; translation: ’40 Liebig recipes composed by the radio cook P.J. Kers’) and Duyvis, a Dutch manufacturer of snacks, salad oils and sauces (Duyvis Salata. Enkele recepten van den bekenden Radio Kok Kers, probably published in 1938; translation: ‘Duyvis Salata. Some recipes of the famous Radio Cook Kers’). If you are curious how Kers sounded on the radio, listen to his recipe for banana fries(year unknown). But reviewer J. v. S. was not heard. A month later Nicolas was back on the air, this time with a recipe for fish fritters. 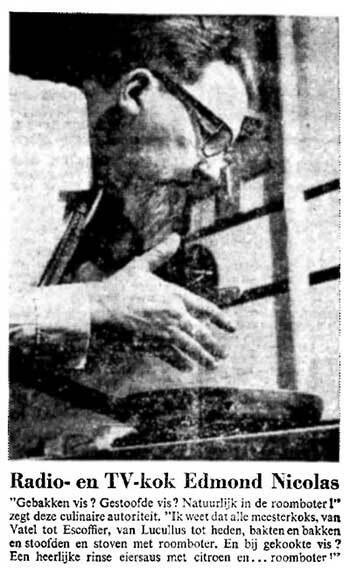 He presented his monthly cooking program for the KRO until October 1956 on Thursday nights. Nicolas was not a professional cook but a biochemical engineer who also wrote regional novels and contributed to radio plays. He died in 1976. On the picture is an advertisement for the Dutch Dairy Bureau in newspaper Het Vrije Volk with Edmond Nicolas looking into a pan from 1962. The KRO must have liked presenting a cooking program, because in November 1956, one month after Nicolas stopped with Pottenkijken, there was a new cooking show. This time it was a professional cook, the Hungarian refugee Andreas Palcsik, who presented the show. His program was called Palcsik veredelt uw keuken (‘Palcsik ennobles your kitchen’, his 1955 cookbook has the same title). This program lasted until January 1959. Palcsik passed away on 28 September of the same year. In the KRO-magazine there is prominent mention of a co-host, Jos van Loon (female). Without having seen the program I can not confirm what her role was. By the way, both Nicolas and Palcsik also presented cooking programs on the radio, but I do not now concern myself with that. Nicolas appeared on television three years after television broadcasting had begun in the Netherlands. He was the first to have his own cooking show, but his was not the first cooking program ever. Dutch National television began as an experiment on 2 October 1951. The few people in possession of a television set (black and white of course) could plug in the apparatus two nights a week, with a choice of only one channel. In the weeks before Christmas 1951 the first programs that had cooking and eating as a theme appeared, but these were all single occurrences. These programs were from the liberal broadcasting organisation AVRO (a cooking demonstration titled Hap-zeit-ie – ‘Snap!’ he said) the socialist organisation VARA with a short talkshow on cooking (Tafeltje-dek-je or ‘The wishing table’) and the protestant NCRV with the instructive Aansnijden en bereiden van gebraad (Cutting and serving a roast). Just before Christmas 1952 there was another installment of Tafeltje-dek-je, with J.Th. Heering, chef cook of the elegant Kurhaus hotel in Scheveningen. But two installments with a year in between does not make that a cooking show. The cookery book of Edmond Nicolas was published in 1955 as Het extra kookboek. Doodernstige recepten van de Heer van Jericho (‘the extra cookbook, deadly serious recipes from the Lord of Jericho’). 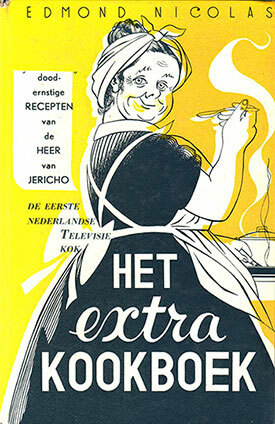 The cover also presents him as ‘the first Dutch television cook’. ‘The lord of Jericho’ is the title of Nicolas’ first regional novel about a village in Limburg that was published in 1946. There are no pictures in Nicolas’ cookery book, as that was not common practise in those days. 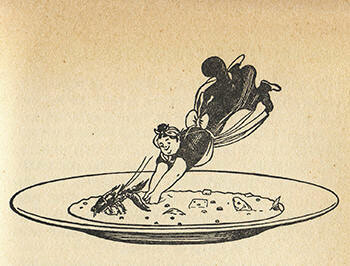 The recipes are illustrated by small drawings from S. Pennink, pseudonym of Piet Pouwels who collaborated with the German SS during the war (source). On the left is ‘bouillabaisse’, the first illustration of the chapter that also contains the recipe for ‘gilt poverty’. Nothing in the book points to Nicolas having a cooking show on television, except for the mention in the cover. Because of the “braising steak and white cabbage” in the review cited above, I have drawn the conclusion (perhaps erroneously) that the recipe in his first show was the ‘gilt poverty’. This is the concluding recipe of chapter IX (‘between wet and dry’) of his Extra kookboek, and the main ingredients are indeed braising steak and white cabbage. During the early days of television broadcasting, all the programs were live and if there were any tapes, these were reused. It is impossible to find out what Nicolas’ first appearance as television cook was like. But if he used the same words in his program as he did in his book (“What you now see is horrible”), it is a miracle there ever came a next installment! In the fourteen chapters of the Extra kookboek Nicolas presents a whole range of dishes in a relaxed conversational style that almost obfuscates the recipes. The chapter that concludes with Gilt Poverty also contains recipes for Bouillabaisse, Clam chowder (with mussels), Pot-au-feu, Borscht, Olla Podrida, Minestrone, Cassoulet de Castelnaudary and Waterzooi. In the recipe for Gilt Poverty it is not very noticeable, but Nicolas uses the words ‘I’ and ‘me’ quite a lot in his cookbook. En tot slot en besluit geef ik u een methode om van twee der minst aanzienlijke grondstoffen: runderlapjes en witte kool, een goede pot te koken. Ge dompelt de runderlapjes een minuut of tien in kokend water, en snijdt ze dan in heel dunne schijfjes, die ge op hun beurt weer verdeelt in stukjes van een paar vierkante centimeters. In een pan smelt ge een beetje boter, en voegt er de rauwe witte kool bij. Wanneer deze begint te zweten voegt ge het kookvocht der lapjes toe, en het vlees; mengt dit goed dooreen, voegt een ferme scheut koffiemelk toe, zout, een paar toertjes van de pepermolen, en stooft even. Wat ge te zien krijgt is afgrijselijk: de klodders geschifte melk kleven aan de onappetijtelijke kool- en vleessnippers. Begin nu eerst de kleur te verbeteren, en tegelijk de smaak: voeg een paar theelepels kerry toe, die ge goed vermengt met het stoofsel. De kleur moet nu goudgeel zijn. En als ge nu maar geduldig sudderen laat, zult ge een gerecht verkrijgen dat bestaat uit malse kool- en vleessnippers, in een dikke, romige, goudgele saus. En dit gerecht noemen we thuis, gezien de ingrediënten en de uiteindelijke kleur: vergulde armoe. And finally I present to you a way to prepare a good dish from two of the least prestigious ingredients: braising steak and white cabbage. You submerge the braising steak in boiling water for ten minutes, then slice them very thinly and divide these in pieces of a couple of square centimeters. You melt some butter in a pan and add the raw cabbage. When this starts sweating, you add the cooking liquid of the beefsteak, and the meat. Mix this well, add an ample slosh of evaporated milk, salt, and a couple of turns of the pepper mill. Simmer for a while. 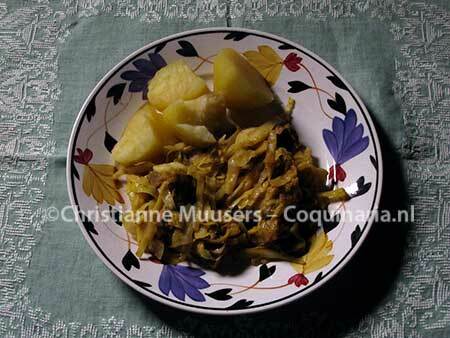 What you now see is horrible: the lumps of segregated milk cling to the unappetizing slivers of cabbage and meat. Now begin with improving the colour, and at the same time the taste: add a couple of teaspoons curry, that you mix well into the stew. The colour should now be golden yellow. And if you now just let it simmer patiently, you will end up with a dish existing of succulent slivers of cabbage and meat, in a thick, creamy and golden sauce. And at home we call this dish, because of the ingredients and the colour: gilt poverty. As can be read in the original recipe, Nicolas presumes that the cook is experienced enough not to need everything explained in the smallest detail. When I do that nowadays, I receive emails telling me I ‘forgot’ to add exact amounts of some ingredients. So in this adaptation I have added the amounts, but feel free to use your own discretion. Main dish for 4 persons; preparation in advance 10 minutes; preparation 30 minutes. Dutch braising steak is cut rather thin. Poach the meat not ten, but five minutes. Then pat the meat dry and cut it in slices or strips. Reserve the cooking liquid. Nicolas does not mention how the cabbage must be prepared. I guess that must be sliced too. When onion is added to the stew, chop it first. Melt the butter in a large pan. Add the cabbage and the optional onion and stir-fry until the cabbage is soft. Then add the meat and the reserved cooking liquid, and a dash of condensed milk. Season with pepper and salt, and see if it is really such a horrible spectacle as Nicolas suggests. Sprinkle curry powder in the pan, and stir everything together. Leave the pan, covered, on a low heat for about twenty minutes. The recipe was broadcast in 1954. So very probably the dish was served with boiled potatoes. Edmond Nicolas, Het extra kookboek. Doodernstige recepten van de Heer van Jericho. (‘The extra cookbook. Very serious recipes from the Lord of Jericho’) UDH Baarn, z.j. (1955). Andreas Palcsik, Palcsik veredelt uw keuken. (‘Palcsik ennobles your kitchen’). J.M. Meulenhoff, Amsterdam, 1955. Richard van Schoonderwoerd den Bezemer, Een vreemde eend in de bijt, Ouwe Bram leeft nog!, volume 4, nr. 2/3, 2000. (about S. Penning, pseudonym of Piet Pouwels). In 1954 Edmond Nicolas was the first cook with a regular cooking show on television. On this page you’ll read more about him and the first cooking shows.